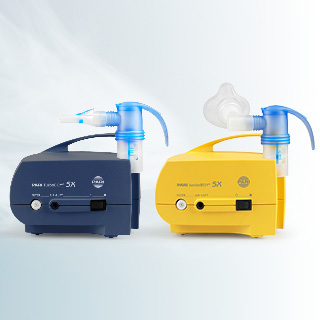 Using nebulisers correctly with children requires time, a calm environment and even sometimes a soft toy. Paediatricians often opt for nebuliser therapy as the first-line treatment for chronic respiratory disease. 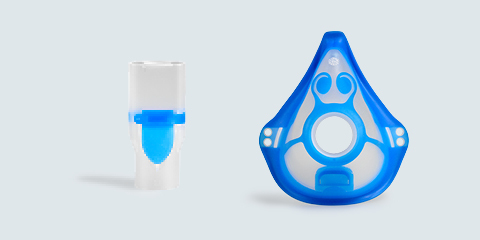 Increasingly, parents are using nebulisers with their children to prevent colds as well. Nebuliser therapy is a proven method, for both colds and severe respiratory diseases. If therapy with a nebuliser is a positive experience for your child, with plenty of time set aside for the treatment and sometimes a soft toy or picture book, this contributes to successful treatment outcomes. When children sit up straight it is easier for the aerosol to get deep into their airways. It is completely normal for children to have up to eight respiratory infections a year before they reach the age of 10. In most cases these infections are caused by more or less harmless viruses. To better boost children’s defenses against these cold viruses, more and more parents are discovering nebuliser therapy for preventing colds, for example using the PARI JuniorBOY SX and the PARI NaCl Inhalation Solution. Bronchitis, asthma and cystic fibrosis, i.e. chronic respiratory diseases, present additional challenges to paediatricians and parents. 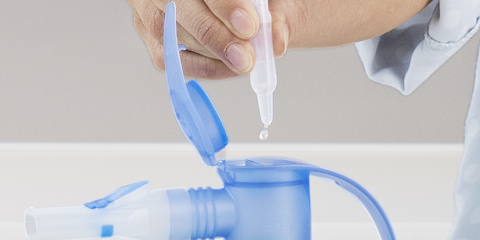 To treat them, medications for wet inhalation with PARI nebulisers are commonly used. By using nebulisers correctly with children, medications can get to where they need to go. 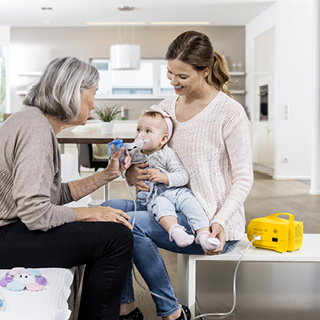 Apart from that, inhalation, for example using a PARI inhalation device together with a nebuliser, is sometimes the only way to deliver medications deep into the tiny airways of babies and toddlers. Children are active and want to help. Don’t shy away from involving your child in the preparations for the forthcoming nebuliser therapy. For example, you can have your child take the nebuliser and maybe even add the inhalation solution (please never leave your child unsupervised when doing this). It may also be helpful to have the favourite soft toy go first and show how to use the nebuliser. Tell your child why the inhalation therapy is necessary and good for him or her. Show your child that aerosol flows out of the mask or mouthpiece like a kind of mist and then explain the next step: Now it’s your turn to inhale. It is important that the nebuliser therapy is a positive experience for children, especially if they have to use it several times a day. If things ever don’t go that well, it is best to shorten the nebuliser therapy and try it again at a later time. Make sure that older children are in a relaxed sitting position during nebuliser therapy. First and foremost, this means sitting upright or even standing instead of lying curled up on the couch. Why? This is the only way the aerosol can get deep into airways, where it is needed. An example of a good distraction so the child’s breathing will remain steady and calm during nebuliser therapy is to look through a picture book together. For a baby, it is helpful if you are holding him or her during nebuliser treatment, making sure they are a little sleepy and not hungry at the time. If necessary, you can also use nearly silent inhalation technologies, such as the VELOX, for nebuliser therapy at home or when traveling. In any case, regardless of the version you choose, you should make sure the environment is as stress-free as possible when using the nebuliser. This makes even frequent nebuliser therapy a little easier every time they are used – for parents, too.